I am a proud owner of 2009 Bajaj Pulsar 150cc DTSi. I rarely find complete specification on Internet so I uploaded myself. Engine Type 4 stroke, Single Cylinder, Natural air cooled. Spark Plug 2 x Champion RG 4 HC. Transmission 5 speed constant mesh. Weight Vehicle Kerb Weight 143 Kg. Gross Vehicle Weight 273 Kg. Brakes Front Disc Type. 240 mm Disc. Rear Mechanically expanding shoe & drum type.130 mm Drum. Very interesting post. 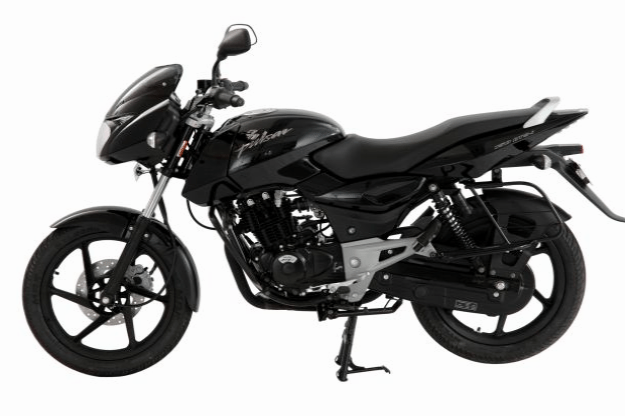 Pulsar 150 is the best bike in its segment and much better in comparison to its rivals. Am planning to buy it soon. I appreciate all the work you’ve put into your site! I’m going to Tweet this out to my followers… Definitely worth passing on! I want to know about the petrol tank capacity. Is the tank capacity is 18 litres excluding reserve or its 15 litres including reserve. It is 18 liters including Reserve. From reserve 3.2 liters 1.2 liters is not usable. The photo which you have displayed is not 2009 model. Its 2010 model. Why? Just cause it was all black ? So if I’m reading this right, the complete capacity of fuel here is 18.2 l of which 17 l is usable. In other words if I’m to get my tank fully filled, it should not be more than 17 l, is this right? Yap. but it might me slightly less then that. and also a question for you can i drive my bike in ON .at having only 3 litres at my tank for ??????????? If you are not using your bike in reserve(not moving fuel knob) then Pulsar has tendency of accumulating water in the tank. Its perfectly normal usually not harmful. In case that happens. You can turn off fuel knob and unscrew a small screw near carburetor there. This will flush your carburetor. If any water that will flush through a small plastic overflow pipe. If you think that there was no patrol in tank during ‘On’ position, And low fuel ‘Red’ light did not turn on. You need to get your patrol sensor checked. As spec says, This model has 18Litter capacity but not all is usable. Any bike can develop an engine problem (If not rode properly). It’s a average bike, Yes, Is it expensive, No, Does this gives the value for money you are paying, Yes. You will get more then you pay, Yes. Will it beat Duke 200, No!.